With 2012 ending and 2013 soon beginning I have been thinking a lot about beginnings and endings -- in my life currently ( friendships ending, a new & exciting life beginning as a newlywed) but also I've been thinking about some of the series that will be coming to an end in 2013 and ones that I'm REALLY excited about that will be released in 2013. True story: I have Requiem in my posession and I'm honestly too afraid to start it. This is the LAST book of this trilogy and I am beyond nervous. I just can't even. I haven't yet read The Crown of Embers but plan to soon but I do know The Bitter Kingdom comes out in 2013 which will conclude this trilogy. I'm exciting because this is a series that is really getting me into fantasy! The end of the trilogy is slated for 2013 (I'm assuming Fall since Unravel Me is early 2013) but I really love Tahereh Mafi's writing and totally didn't expect to love this book as much as I did because it was SO hyped up! I feel like this series has been a bit underrated. I mean, the Furies are crazy and make things very interesting. I just really have enjoyed this series SO MUCH and I hear it ends in 2013. I flew through Eve (despite having some problems with it) and could picture the world so clearly in my head and that ending of Eve! WOW. I still need to read Once but when I do I'm sure I'll be excited for the conclusion. This series is so addictive if you like fast paced mysteries with a bit of a supernatural twist (she can hear the echos of people who have been murdered) and romance. Book 1 & 3 were my faves so far but they way everything was shaping up at the end of book 3 I'm SO EXCITED/NERVOUS for the conclusion. I hope the creep factor is there in Dead Silence like it was with The Last Echo! I cannot wait to read Sever! Lauren's writing is so mesmerizing and I can't wait to see how some of these plotlines wrap up! What a crazy story this one is! I still have yet to read book 2 but I think I want to wait until book 3 is closer to publication with this series. Mara Dyer is pure WTFery mindefferey at its glory. I didn't LOVE ( I liked it) MD1 like others did but there was something about it that makes me HAVE to know what happens. Pulse by Patrick Carman: I just received this in the mail and I'm really excited about it -- mostly because I dream of the day when I can move things with my mind. Umm, hello house getting clean while I read. Let The Sky Fall by Shannon Messenger: I'm planning on starting this soon but I heard about it during BEA and it sounds awesome. Plus I met the author and she was really nice so it makes me all the more excited! Mind Games by Kierstan White: Looks dark and twisty and I'm excited! Mila 2.0 by Debra Drizer: Definitely wanting to start this soon! I've been digging sci-fi lately and I'm hoping this will be everything that Eve & Adam wasn't for me. I just have so excitement for stories where the MC was a clone or created in a lab! The Archived by Victoria Schwab: Coolest concept I've read about in a while! Dead people end up on shelves like books in a library? I love super imaginative books and I am SO SO SO excited! The Ward by Jordana Frankel: I've been excited about this book since I featured it on my Catalog Creepin' post! It's especially chilling since, after Hurricane Sandy, we saw a Manhattan that was under water. Reboot by Amy Tintara: I'm so intrigued by the idea of people becoming "reboots" after they die in this novel! Level 2 by Lenore Appelhans: Already read this one and I'm so excited about it! My review will be up on The Perpetual Page-Turner within the next few weeks. Corner of White by Jaclyn Moriarty: All I saw is "genre-busting" and that excited me for some reason. I'm excited about books that take place in parallel type worlds so yay! Spellcaster by Claudia Gray: I had been thinking I needed a good witch book and then this little beaut showed up! Taken by Erin Bowman: A world where boys are taken and disappear into thin air when they turn eighteen? Sounds so intriguing! Especially when the MC, a boy days away from his 18th birthday, finds a note from his mother that makes him question things! Icons by Margaret Stohl: I want to know why the heck people dropped dead, why some people survived and what the heck the Icon is!! The Program by Susanne Young: This is the one I'm probably MOST excited about because it just sounds sooo good and I liked A Need So Beautiful by this author (still need to finish the series). Teen suicide is an epidemic in this world and anyone showing signs of depression get sent to "The Program" -- the only proven way to "help" the teens. The Madman's Daughter by Megan Shephard: DAMN YOU, Megan Shephard! I read The Madman's Daughter this month and I am regretting that (no, not really) because now I have to wait until book 2 and well this one ended in a way that made my jaw drop. The Rules by Stacey Kade: Clearly you see a trend of me being excited about books where people are made in labs? But this MC is made from human and extraterrestrial DNA so um THAT sounds even more cool and the summary of this book has a hint of a Roswell feel to it (I LOVED ROSWELL!). 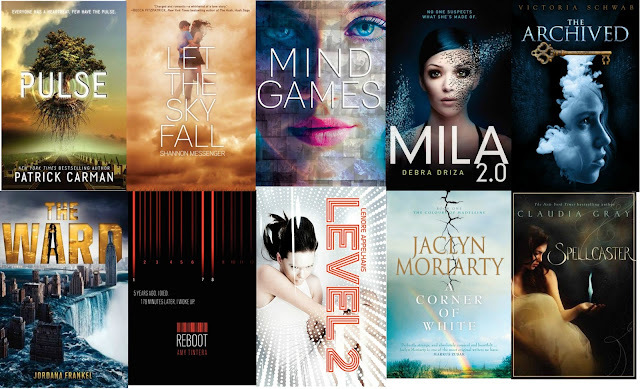 Which series are you reading that end in 2013? What series are you excited to start in 2013?? Ooh, so many interesting books/series to check out! I'm definitely excited to continue the Shatter Me series, but I'm also excited to start the Delirium series and the Unearthly series! I will be right there with you when I get Requiem in my hands. I'm super excited to start it, but I am going to be devastated... I know I will. It'll be over. :( I haven't started the other series that are ending, but I have them on my to read list. There are so many amazing titles coming out in 2013!! I'm so excited. The ones that I haven't heard of I'm checking out on GR right now! I cannot WAIT for Requiem and I just got an ARC of Sever and I'm really excited to read that too! I also really need to catch up on The Body Finder. I've only read book one so far! 2013 is going to be a great year for books! I just picked up The Girl of Thorns and Fire today and can't wait to start it! There are so many great series ending, and a lot of potential for new ones! It's going to be an exciting year, especially since this will be a new year for my blog as well. I just started reading Delirium and love it, so I'm sure I'll be finishing that series in 2013 as well! I'm also excited about the third Divergent book--out of all the books I'm looking forward to in 2013, that definitely tops the list. I need to know how this trilogy ends! And I'm really excited for Shatter Me & Taken as well. Pulse looks so good! I looove Patrick Carman. Plus the cover is sick! Unravel Me. Ah that book. I have so many emotions. I can't wait for book 3. The parents I mentor have been able to shift their behavior to create an open, harmonious relationship with their teens. The better your relationship with your teen during these already scary years, the safer they will feel in the world and the bigger they will participate. yes now we are here for Connect With Your Teen Daughter with you. I'm so excited/sad about The Body Finder series ending. I agree with you about books 1 and 3 being my favorites. I read the second Mara Dyer book last month and my mind was blown, again. A number of your 2013 series have me excited as well. I took a copy of A Corner of White at NCTE for the same reason you did. I love the idea of genre-busting, and I love like Moriarty's writing. Let the Sky Fall and Pulse look super cool as well. Those covers are all gorgeous! Wow I can't believe so many series are ending this year! It's going to be so sad to see them go. But I'm also excited to see new things from all those authors. And some of the new books look amazing! New Adult: Is it really necessary? Top Ten Tuesday -- FREEBIE! !